Back in the 17th Century the area where the Union Terrace Gardens now stand was a wood called Corbie Heugh after the crows which gathered in the grassy valley and within the bank of trees. There are still some Elm Trees dating back to the 18th Century. The ancient Scots word for crow is Corbie. In the 18th Century the area was used by local people as a bleaching green to whiten their linen. The flat land was fenced off and the Denburn area was culverted underground when the North railway line was constructed. This work was completed in 1868. James Mitchell turned the area into gardens for the public. The Gardens were officially opened to the public in 1877. The Union Terrace Gardens are famed for its sunken Victorian garden and the floral city crest and Aberdeen coat of arms. There are new floral displays and themes each year. For example in 1983 the centenary of the Boys Brigade was marked with a special floral display and members of the BB's helped in its creation. Union Terrace Gardens Aberdeen can be found by Union Street, across from Barclays and the Thistle Hotel. 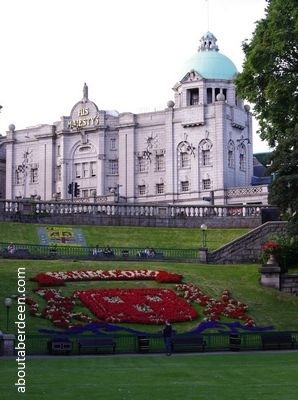 Union Terrace Gardens in Aberdeen has been used for an assortment of activities and entertainment over the years such as the outdoor ice rink. Many folk still remember when the park was famed for its dancing whilst others remember the large outdoor draught games. Others will remember organised events and school trips. Some of these activities no longer take place and the park has recently been rejuvenated and is proving a popular place to relax in the Aberdeen City centre. Despite groups lobbying for the Union Terrace Gardens to be used as an underground car park for city shoppers and visitors, a restaurant and even the building of leisure outlets this historical park remains a green and pleasant place to visit. In November 2008 Sir Ian Wood proposed a �50 million rejuvenation plan for Union Terrace Gardens which involved building an open plaza. In May 2010 Aberdeen Councillors voted to accept Sir Ian Wood's donation of �50 million toward the Civic Square Aberdeen project. Several weeks before an anonymous �5 million donation came from another Aberdeen businessman. This all flowed months of public consultation, polls and petitions. In 2006 it was suggested that Union Terrace Gardens and park house an Aberdeen Centre for Contemporary Arts. Aberdeen City Council funded �75,000 towards a feasibility study and in 2007 designs were revealed for an �8 million art centre. In June 2007 Aberdeen City Council funded a further �50,000 towards more surveys for the Peacock Visual Arts group. Should the Aberdeen Centre for Contemporary Arts be built then the Peacock Arts and the teams of the Aberdeen City Council Arts Development, Arts Education and Citymoves will relocated to the new building. Peacock Arts are currently located in Castle Street in Aberdeen. The designers of the Aberdeen Centre for Contemporary Arts were architects Edgar Gonzalez. Funding for the Aberdeen Centre for Contemporary Arts building will be provided by a loan of approximately �3 million by Aberdeen City Council and grants from the Scottish Arts Council and Scottish Enterprise Grampian. The Victorian toilets at Union Terrace Gardens have been shut to the public since the year 2000. The Victorian toilet block remains the property of Aberdeen City Council. In December 2007, Mr Steve Bothwell, the owner of Cafe 52 in the Green, Aberdeen, announced plans to turn the Victorian loos into a Parisian style bistro. His designs for the Victorian toilets would keep many of the original architecture and historical features such as the bottle green Victorian tiled walls, terrazzo flooring mosaic floors and stained glass. Should the Peacock Visual Arts centre plans be accepted by the Scottish Government Mr Bothwell will submit his own plans for the Victorian toilets and either buy or rent the Union Terrace Gardens building from Aberdeen City Council.